When Activision unveiled Call of Duty: Black Ops 4 in March, Switch was not included among the confirmed platforms. But a new discovery at GameStop is giving hope that the shooter will make its way to the system after all. 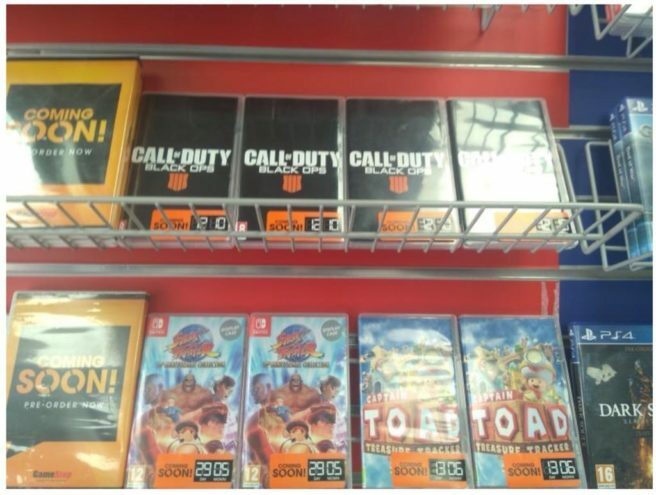 Today, Twitter user AUGMC snapped a photo showing a Switch case for Call of Duty: Black Ops 4 at the retailer. Activision will be blowing out Call of Duty: Black Ops 4 at an event later this week. If a Switch version is happening, perhaps we’ll hear about it then. Activision could also choose to announce it even further down the road – something that has happened with other Nintendo platforms in the past. Of course, nothing is confirmed, so take this with a grain of salt for now. Thanks to Jes T for the tip.